• Is ULC “LISTED” to “Miscellaneous Tank Accessory for Flammable and Combustible Liquid Tanks”. This category covers accessories consisting of factory-made parts, components, or products designed to be assembled, installed, or used with above ground or underground storage tanks for flammable and combustible liquids. • Listed and certified to NSF 14 and 61 standards and meets the requirements for ASTM Standard B88. CB Supplies has three lines of copper coated piping, namely the GUARD SERIES. CB Supplies brings you the best of the plastic and metallic worlds. For nearly 40 years, CB Supplies has been supplying a variety of industrial, commercial and residential piping, beginning with metallic pipes and, as demand changed, evolving to plastic tubing. Today, CB Supplies has taken the next step. We have combined the durability and dependability of copper with the corrosion resistance and easy identification of polyethylene. The result is a new series of hybrid products that bring the best of plastic and metallic worlds to the Natural Gas (NG), Liquefied Petroleum Gas (LPG), fuel oil and potable water industries. GAS GUARD is a copper and polyethylene composite tubing developed for Natural Gas (NG) and Liquified Petroleum Gas (LPG) applications. 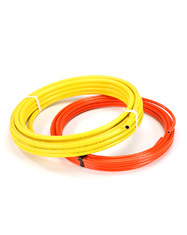 Appropriately sized for fuel-gas applications, GAS GUARD is comprised of type L/G soft copper tube that is coated with a continuous seamless layer of yellow polyethylene. The yellow coating is clearly marked, identifying that the tubing contains fuel gas. GAS GUARD may be safely installed in either low pressure (LP) or elevated pressure (EP) distribution Systems. PETRO GUARD is a copper and polyethylene composite tubing developed for fuel oil applications. The orange coating is clearly marked, identifying that the tubing contains fuel oil. PETRO GUARD is comprised of Type ACR refrigeration tube. HYDRO GUARD is a copper and polyethylene composite tubing developed for potable water applications. HYDRO GUARD is comprised of Type K/L soft copper tube that is coated with a continuous, seamless layer of red or blue polyethylene, for hot and cold water lines, respectively.